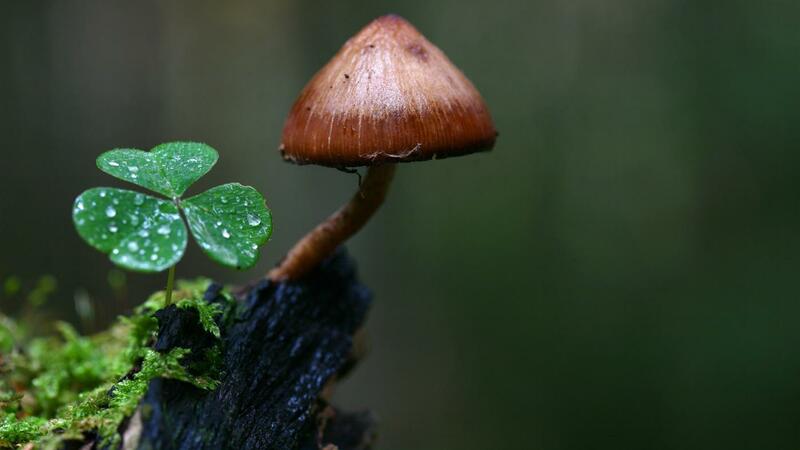 Mushrooms have the ability to secrete exoenzymes, which digest organic material outside of the fungal body. This allows them to consume a greater variety of materials for nutrition. Adaptations are specific to the type of mushroom. Morel mushrooms, for example, are able to survive harsh weather conditions with a sclerotium, a component that grows underground and protects the fungi mycelium until conditions permit it to grow. Morel mushrooms have several other types of adaptations. The primary and secondary mycelium allows it to feed off the roots of trees to acquire nutrition. The P. cubensis and several mushrooms in the Agaricales order have gilled undersides that allow them to produce many basidiospores at the same time. Gills can easily release these spores by rotating themselves so they are parallel with gravity. The Auricularia auricula-judae fungi have an adaptation that allow it to withstand periods of dry conditions. It contains hyphae, which are networks of tiny filaments. These filaments are large and able to expand more than those found in other fungi types. When there is a period of drought, the hyphae walls collapse and restrict, causing the fungus to shrink. When moisture is available, the walls expand again and return the fungus to its original shape. How Do You Make Vegetable Stir-Fry? What Is a Recipe for String Bean Casserole? What Are Some Easy Recipes for Stuffed Mushrooms? What Is a List of Non-Starchy Vegetables? What Is a Simple Recipe for Stuffed Mushrooms? What Are the Benefits of Eating Cucumber?